Tanjong Beach Club Sentosa Island is a bistro bar that is located at the end of the beach with sexiest view in Singapore. The location isn’t too far from the parking area. It is set to be a normal restaurant that looks like a beach bar. Most visitors of Tanjong Beach gave high rates for the beach with sexiest sands. The sexiness also makes the beach is rated in kinds of TV shows, Top Chef, becoming a shooting area for some films and video clips. The location in the last stop of the tram line of the beach, the restaurant looks like an exclusive one. The beauty of the beach offers stunning space for sun bathing and much more. The bistro is designed with a dining room that blends to the surroundings perfectly. The space is designed uniquely with two floors and ceiling windows that allows the visitors to enjoy the beautiful blue sky from the inside of the restaurant. So the delicious modern seafood will be complete with the amazing panoramic views of blue sky and golden color of the beach sands. 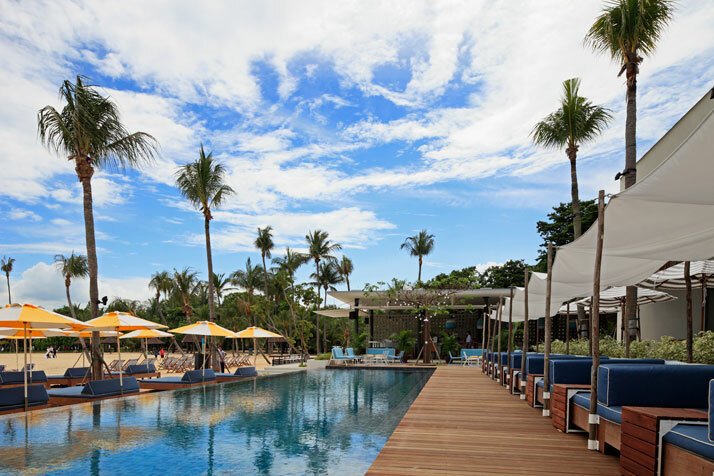 You can feel the perfect blending of frenzy world outside with the Tanjong Beach Club Sentosa Island. - TODAY stated that the chef of the restaurant paid attention much to the textures of the meals. The chef always brings the elements of crunch, crisp, and creaminess that are crucial to make sure that the meals are exciting for every customer. - The Strait Times wrote that the creations in the menu reflected the talent of the chef that combining good tastes. - WHERE Singapore reviewed that the spot is hard to resist for the pleasant vibe and relaxed atmosphere. The restaurant has great brunch menu, especially when you need some time for lazing on the seashore. The restaurant cuisines offered in Tanjong Beach Club Sentosa Island are modern European meals, seafood, and bar. There are long list of menu for daily, weekend brunch, as well as kinds of wine. If you are going to visit the restaurant, you can choose the operation times at 11am to 9pm in Tuesday to Friday and at 10am to 10pm in Saturday and Sunday. Don’t visit the restaurant in Monday because they are closed for order. Located in 120 Tanjong Beach Walk, Sentosa Singapore, the Tanjong Beach Club Sentosa Island is suitable for casual dining, Al Fresco, and also large parties.